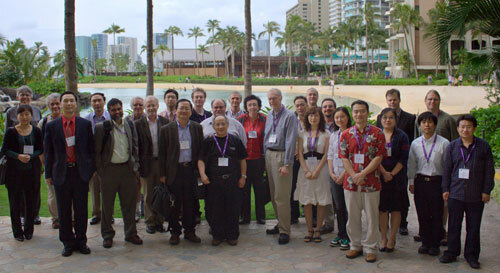 Pacifichem 2010, the first international chemistry conference to feature a high-pressure symposium, took place in Honolulu, HI December 15-20, 2010. It was organized by the International Chemical Congress of Pacific Basin Societies and sponsored principally by CDAC and Lawrence Livermore National Laboratory. A total of 47 delegates presented 38 oral papers and 8 posters. Talks from CDAC scientists included the keynote lecture by Russell Hemley, and lectures by Zhenxian Liu and Maddury Somayazulu (Carnegie), Jeff Yarger (Arizona State), and CDAC steering committee member Choong-shik Yoo (Washington State). NNSA-supported scientists Jonathan Crowhurst (LLNL), Nir Goldman (LLNL), Christian Grant (LLNL), Robert Hermes (LANL), Michael Howard (LLNL), Riad Manaa (LLNL), David Moore (LANL), and Oliver Tschauner (UNLV) and Carnegie collaborators (through EFRee) Alan Anderson (St. Francis Xavier), Giulia Galli (Univ. 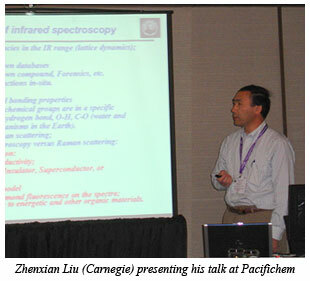 California, Davis), Robert Mayanovic (Missouri State), and Chris Tulk (ORNL) gave talks as well. Several outstanding Carnegie alumni also participated: Takuo Okuchi (Okayama University), Sung Keun Lee (Seoul National University), Haozhe Liu (Harbin Institue of Technology), and Yang Song (Univ. Western Ontario) presented talks. Song was the principal organizer of the symposium. The symposium delegates represented a broad range of the world including US, Canada, China, Japan, South Korea and Europe. The impact of this symposium will be furthered by the publication of a special issue in Journal of Physical Chemistry.